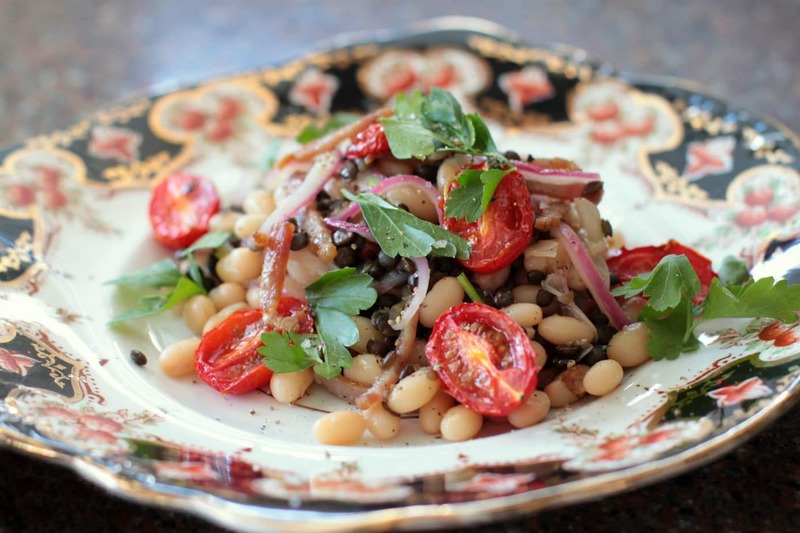 This warm bean bacon salad has a surprise ingredient….lentils! 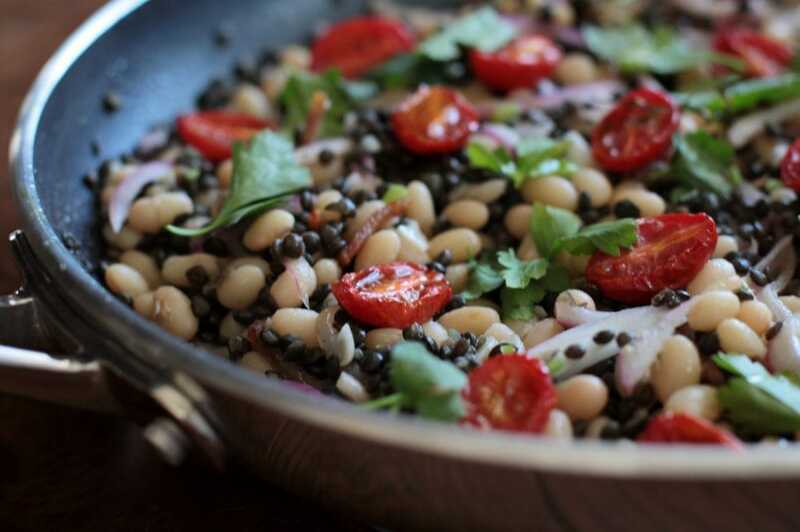 Lentils are packed with power nutrients and good for your soul. Add a hint of acidity with the oven roasted tomatoes and some freshness with the parsley. 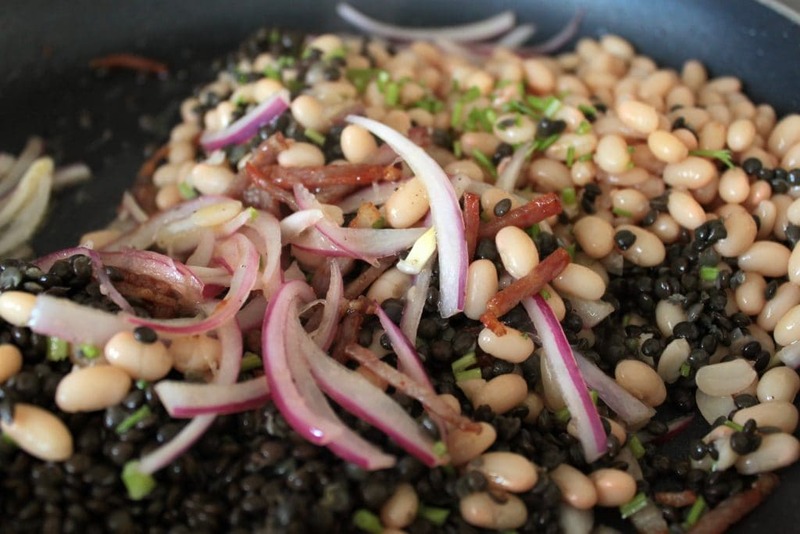 One more kick at the cat…er Canadian Lentils Recipe Revelations Challenge. 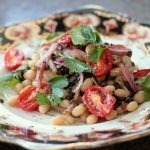 I realized I had not entered a salad as of yet and there were plenty of left overs in my fridge that were just begging to be made into this Warm Lentil and White Bean Salad with Bacon and Roasted Grape Tomatoes. For instance, last weeks Calgary Farmer’s Market bag of grape tomatoes, several kinds of ‘please use me!’ herbs, leftover Beluga lentils from my Shrimp Dumplings, and leftover White beans from a Bean, Chorizo and Kale dish I did earlier in the week. A quick aside about lentils…I spent an hour and a half dismantling the dishwasher and scrubbing it clean to find several appropriately shaped Beluga lentils were blocking the sprayers. I may or may not have sworn a bit, then proceeded to lecture everyone on the benefits of having a dishwasher and not taking advantage of it. Yes, I went there. A slight bit of thought went into this salad. I still wanted something warm and comforting but also a bit fresh and full of zip. I absolutely love the flavours of a warm German Potato Salad. My aim was aiming to replicate a reasonable facsimile of it using the lentils and beans. 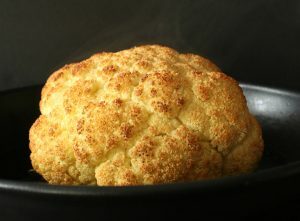 It worked out so well I must admit I am eating a bowlful of it as I am writing this post. Lay sliced tomatoes cut side up on a baking sheet. Sprinkle thyme sprigs, salt, and pepper. Drizzle olive oil over all and bake at 375 for about 20 minutes. Add sliced onion to a bowl and drizzle vinegar over. Add salt and let sit while you prepare the rest of the salad ingredients. When the tomatoes are done take them out of the oven and rest them on the counter. Fry bacon and let sit on a paper towel. Using the tiny bit of bacon oil from frying the bacon, heat up the pan again and add the onions and red wine vinegar. Season and cook only until they start to soften. Add the lentils and beans, parsley stems, and bacon. Sauté until they are all warmed through, add a couple more dashes of red wine vinegar and olive oil, then plate your salad. Add the tomatoes and parsley, then season. Enjoy! What a fabulous dish – I love your new look too! Thank you 🙂 It was good..we had it later cold and it just wasn’t the same. Yum! Thanks for this. Lots of textural munchieness 🙂 . Oh my gosh! This is incredible. I have to bookmark this one. 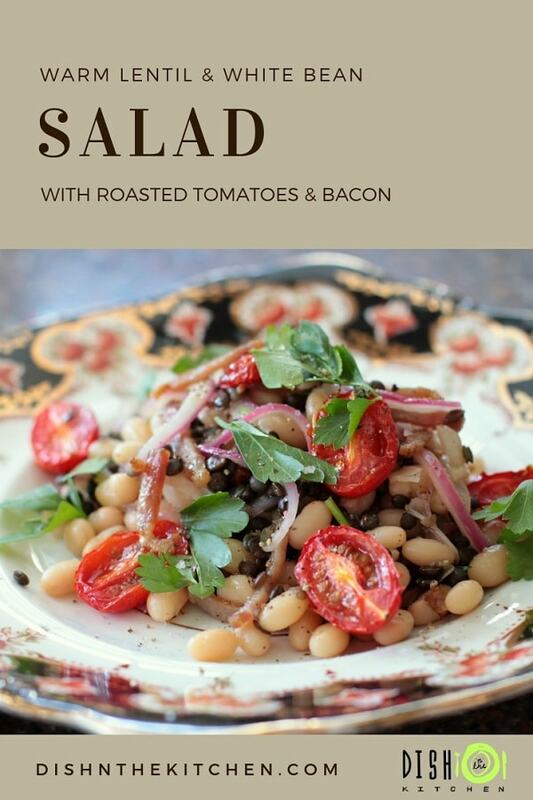 Love the roasted grape tomatoes along with lentil and white beans. Plus…bacon! yes, it’s a great combo…you’ll love it! I wish i had this to eat right now!!! !